Pairing game has always been a trend in showbiz — Guy and Pip are the ones to blame! The popular cinema love team of Nora Aunor and Tirso Cruz III in the 1970’s started the matching game in the world of local entertainment. Their astounding works in film, television and recording made them the most famous Philippine show business love team of all time. Alden Richards and Maine Mendoza as Guy and Pip. Even Alden Richards and Maine Mendoza dressed up as Guy and Pip in one of the episodes of Eat Bulaga! In this generation of young superstars, pairing game still exists and it is actually the most effective strategy in capturing the attention of the people who are crazy about the local showbiz. Some of today’s trending love teams who grew up together at work developed an amazing friendship that eventually led them into something more special. It’s no surprise these young actors and actresses who have chemistry on-screen find themselves falling in love in real life, too. Take a look at showbiz’s hottest young tandems who take their on-screen chemistry off-screen as well. Let’s watch these unforgettable videos of KathNiel, LizQuen, and JaDine confessing about their real score. Lights, camera, romance! 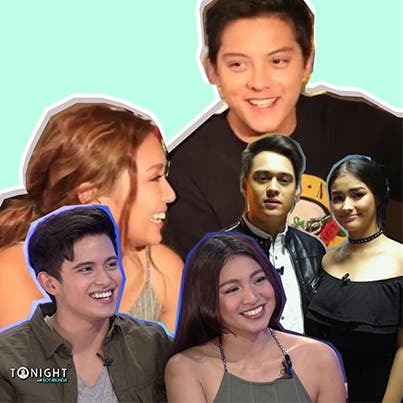 Which loveteam has the most genuine interview? Sound off in the comments section below.